An appointment with Ted Peterson starts with a comfortable chair and a glass of wine. At Wit Clothier, a custom clothing shop in New Bern, every detail is meant to make people feel their best. “It doesn’t matter what you wear as long as it fits,” Peterson says. 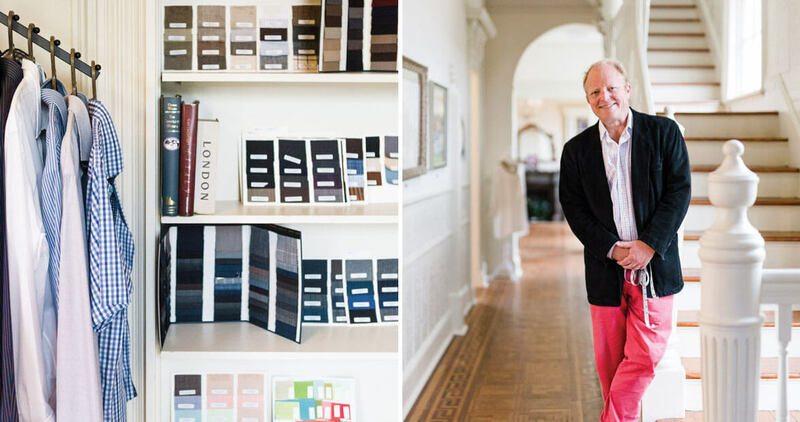 With his customers settled in the second-floor fitting room on a light blue antique sofa, Peterson pulls out a book of fabric samples — supple wools in navy and dark gray; light, summery cottons; creamy, multicolored silks — and then invites them to feel the weight and texture of the fabrics. Downstairs, one of Peterson’s business partners or family members — the two are not mutually exclusive — guides customers through the showroom, which shows off not only Peterson’s work, but also the spectacular 12-foot windows, ornate tin ceilings, and gaslight chandeliers of the Edward R. Stanly House, a neo-Renaissance-style home built for a wealthy businessman in 1850. But the fitting room is subtler, cozier. Peterson’s tape measure moves swiftly as he discusses colors, textures, buttons, and thread. The experience is an opportunity to take chances — but even if you just want a plain, navy blue suit, Peterson says, there’s only one of them, and it was made for you.